Time sure flys, we are reaching the end of the year now, next month FB feeds will be flooding with holiday bakes, cinnamony, nutmegy, gingery bakes! I can't wait to bake something that will tickle our senses and bring in that holiday spirit, whether we celebrate christmas or not, that is totally a different matter, but that cheer of holidays, new year feel is ultimate. Coming back to our Week 3 of november BM, i chose Kids delight- Veggies sneaked in, a monthly event created by Srivalli, hosted by Vidhya this month. A wonderful theme, i know all mothers would appreciate this. We only know what all we mothers do to make our kids eat a small portion of veggies. Kids these are days are smart, they learn about junk food and importance of eating their fruits and veggies in their school. So many of them are ok eating a fair share of veggies put on their plate, but there are kids who are lil fussy and don't like the look of certain veggies. Example, my elder one, he would run a mile if i ask him to taste a small stick of carrot, whereas my lil one would happily chomp of a whole carrot like a little bunny. So if you have such examples at home, you definitely need some help in masking veggies into some other thing, which they would happily eat. Here is a simple kheer, which i make regularly for festivities at home. Dump all the ingredients in the pressure cooker cook, and blend, then serve. Such an easy kheer to make. 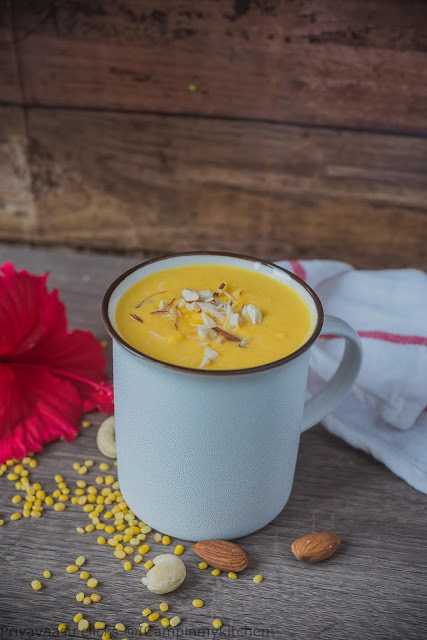 I bet your carrot hating kid would happily gulp this kheer down, the richness of cashewnuts and milk make this a filling snack anytime. Wash carrot, peel and chop roughly. 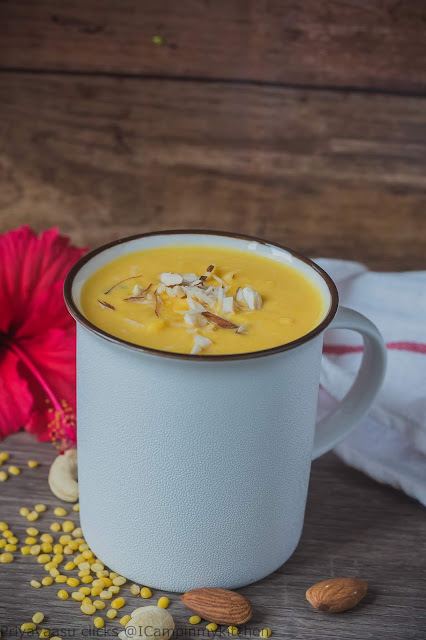 Take chopped carrots, coconut, moong dal, saffron and 1 cup of milk in a pressure cooker. Add 1/2 cup water and cashewnuts to it. Pressure cook this for 5-6 whistles. Let the pressure fall on its own. Add the remaining 1 cup of milk to this and blend the contents smooth. Take the kheer again to stove-top, add cardamom and crushed nuts, let it for another 10 minutes in a simmer flame and take it off the stove. Add some chopped nuts to this and serve warm. You can also make this in Microwave. Use a deep bowl so milk doesn't overflow. 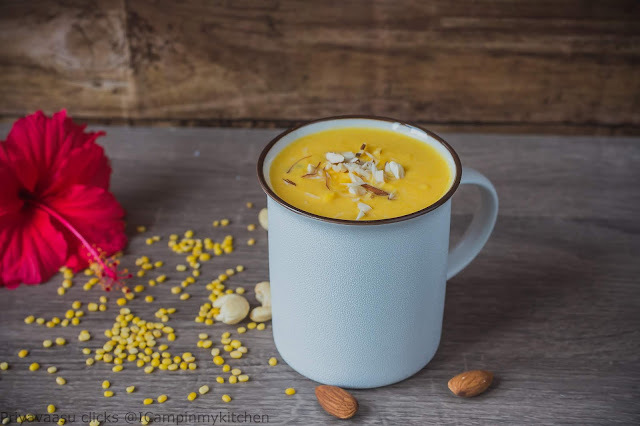 Take the chopped carrots, coconut, moong dal, saffron and 1 cup of milk in a microwave safe bowl, microwave cook at power 100 for 15 minutes. Once cooked, remove the bowl from the microwave, add remaining 1 cup of milk, blend the contents smooth using a stick blender. Add cardamom and chopped nuts to it and microwave the contents again at power 50 for another 8 minutes. Take it off the microwave and serve warm, garnished with nuts. Carrot in moong dal kheer looks sinfully delicious!! Love the color and want to grab that mug of kheer right away. This pressure cooker kheer sounds so yummy and needless to talk about the addition of carrots. This is so delicious and the color is just wow. I love making kheer in pressure cooker as well, such a delightful and very eye pleasing kheer there. Delicious. I love creamy puddings in all its varieties - this looks fabulous and I love the gorgeous color. That is an absolutely fantastic kheer Priya. Wonderful way to sneak in carrots. And it looks so festive too. So creamy and delicious! I love this and the carrots add such a beautiful color to the payasam. The pictures definitely elevate the taste of the payasam, Priya. I love to add carrots to any kheer just for the extra oomph it adds both color wise and flavor wise. Carrot and moongdal payasam looks so nice. Awesome pics. OMG that payasam looks soooo inviting Priya. That color is just amazing. Love the combination of carrot and moong to make this sweet treat. Wow Priya that kheer looks fantastic and what a lovely colour!